“Yer an itoge.” I am happy. It’s the only phrase you’ve learned—or at least retained—in the local language. But it seems to be an important one. You’re asked if you’re happy when you open the door to your over-water cabin in the morning. Since it sits atop crystal-clear water and a shallow coral reef, how could you not be? You’re asked when you return from a morning tour birdwatching for colorful tangaras or hiking to a hidden waterfall. With dolphins racing the boat back to the island, of course you are. Then you’re asked as you approach the over-water dining room for a seafood dinner. Since a blowing conch shell announced the meal, your smile has gotten even wider. Yes, you’re very happy on this little island. This peaceful lodge isn’t on Tahiti or Fiji, like you would expect. It isn’t in the far-flung Maldives or the Seychelles either. Surprisingly, it’s a lot closer to home. 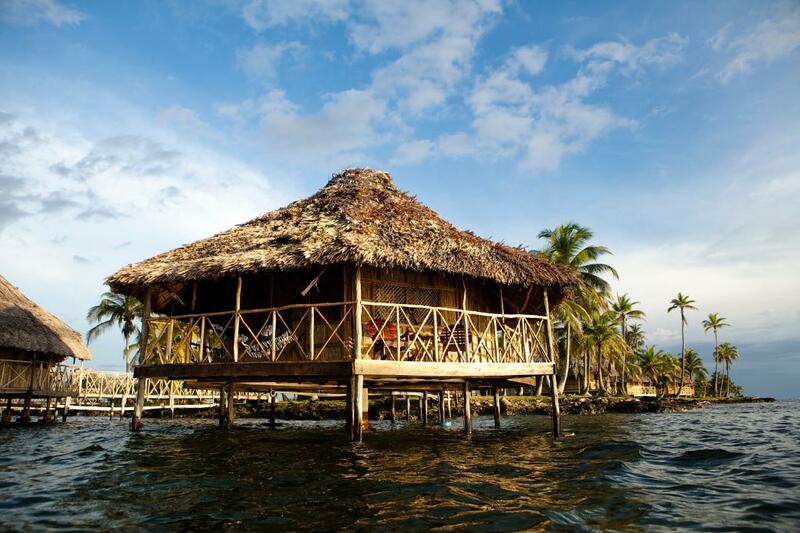 Your over-water cabin stands above the Caribbean Sea. Yandup Island is part of the San Blas Islands. They, in turn, are part of the Guna Yala region that borders Colombia. That means the country is Panama. You arrived at the Yandup Island Lodge after a quick connection in Panama City and a boat ride to Playón Chico. The small island, one of the most densely populated ones in the region, sits just 330 feet from the mainland. It’s the home of the Guna, indigenous people who resisted Spanish conquest in the mountains for centuries before eventually moving to the coast. They still live in pole-style thatched huts, fish from hollowed-out tree canoes, and perform Kammu Burwi dances to this day. You get to learn about their culture and beautiful surroundings from an even smaller, private island just offshore. Mangrove exploration and forest hikes, community visits and traditional ceremonies, plus time on uninhabited islands are all included. So, yes, you’ve found happiness. Yer an itoge indeed.